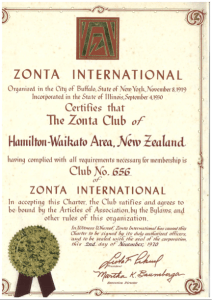 The Zonta Club of Hamilton-Waikato chartered on 2 November 1970 with 29 members, with the Zonta Club of Auckland as its sponsor club. Silvia Cartwright, a local lawyer, (now Dame Silvia Cartwright) was the charter president. The charter board comprised: President : Silvia Cartwright; Vice-president: Bobbie Jarvis (a boutique owner) ; secretary, Dorothy Shields (librarian at the Mormon College) ; Treasurer: K Sharp; and Directors: Alison Somerville, Jocelyn Marshall and Enid Heskett. 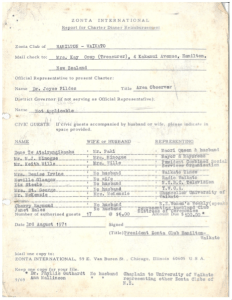 The Club was the third club chartered in New Zealand (club No. 656) and was then part of Area 3 in District XVI which comprised all the Zonta clubs in New Zealand and Australia. At the Club’s 40th birthday celebrations Dame Silvia commented that at the time she was elected as Club President “I am now the president of this club and I actually don’t quite know what I am supposed to do”. The Club’s first project was to make big flowers out of crepe paper and take them to the Waikato Hospital for Christmas. Three members of the new club went to the District Conference in Sydney the following year and Silvia gave a paper. 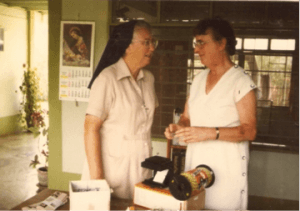 Two members attended the Melbourne Conference in 1979. The Club had a long association with fashion shows hosted Michael Mattar. In 1976 the main beneficiary of the funds was the Te Ara Hou Trust. Funds from the fashion show in 1977 went to Pasifica (Pacific (Allied) Womens Council). The profits from another Michael Mattar fashion show in 1981 was presented to the Disabled Workshops for their hostel. In 1982 the Club held a fashion show with Colin Cole with the profit going to Parentline. 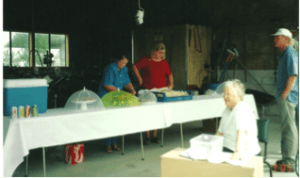 In 1977, 1979, 1981,1983 , 1985, 1988 and 1990 Club members assisted with providing food for Telethon (pictured). A fur and leather evening in 1978 was not quite so successful and the proceeds went to the Salvation Army. In 1980 the Club celebrated its 10th birthday with Pat Evison as guest speaker. In the 1980’s one of the Club’s main fundraising events was the Bride of the Year. This popular event was held in 1980 for the benefit of the Cancer Unit at Waikato Hospital, in 1981 proceeds went to Whitiora House and 1982 to Homemakers. Profit from 1983 to the Waikato Technical Institute award, and in 1985 to the Disabled Living Centre. The Child Cancer Foundation benefitted in 1986. In 1981 the Club held a Beer Festival at Oranga at the university with the profits going to the Plunket Society playground. In 1981 two club members informally sold sandwiches at No. 1 dairy as part of the Ruakura Farm Day to raise funds for a jaguar at the Hilldale Zoo and in 1982 the Club picked up on the fundraiser on a formal basis and in later years the proceeds from this venture (later known as Dexcel Fieldays) were used towards purchasing equipment for the Zonta Dairy Village in Thailand. This catering was a good money spinner for the Club until 2007 when two years of bad weather and poor attendance by farmers curtailed this activity. 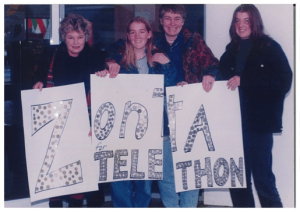 Once the association with the Zonta Dairy Village finished, recipients were Hospice Waikato, Post-Natal Support Group, Zonta International building fund, Waikato Blood Transfusion Centre. 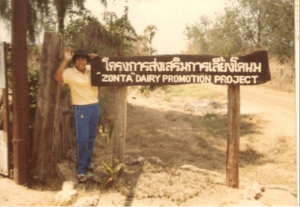 In 1983 and 1984 the Club got in behind the Zonta International in co-operation with UNICEF and the Government of Sri Lanka and sponsored a pure water well in each year. 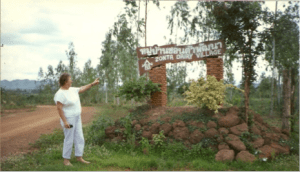 In 1984 the Zonta Club of Bangkok I wrote to the Zonta Club of Auckland seeking assistance for the dairy village project being organized by Sister Francis Xavier Bell. The Auckland Club involved our club and as several of our members at the time worked at the agricultural research centre at Ruakura it was relatively easy to provide suitable assistance. Supariri Intarasooksri (known to the Ruakura staff as Jum) came to NZ to learn about pasture management for milk production and to pass this knowledge on to local farmers. In 1984 the farm covered 1000 acres and supported 55 families with 12.5 acres each and 4-6 cows. There is a milking shed where they are trained to milk cows. The Club donated an electric fence generator and 500 m wire to protect the crops from the stock. Jus made another visit to New Zealand about a year later to learn about butter and cheese making. The club assisted in fundraising and bought a centrifuge and arranged a grant from Foreign Affairs for shipping equipment purchased by Jum . 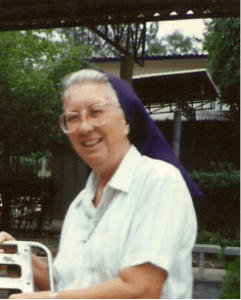 As a result of Sister Francis’ visit to New Zealand with Jum in 1988, the Club persuaded District 16 to take up the water well project in Thailand and Zonta provided a number of wells to Thai villages. 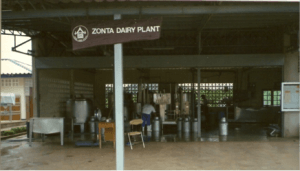 The Club supported the Zonta Dairy Village from 1984 through to 1991. In 1989 the water well account stood at over $2,000 which was a sizeable amount in those days. A tongue in cheek activity “Molly for Mayor of Chartwell” in 1983 saw one of the club members dressed up as a candidate for mayor with two “Clown” helpers and over $1,000 was raised selling helium balloons and taking donations. Hospice benefited from these funds. In 1984 one of the Club members initiated making homemade biscuits to take to Convention later on in the year. The Club also got behind a fundraising campaign for the running costs of a CT scanner at Waikato Hospital. A lamington drive in 1985 saw the profits going to the Raglan Surf Lifesaving Club. The Club contributed funds to the Child Cancer Foundation in 1986 and also got involved with a Radiothon to help raise funds for the Foundation. 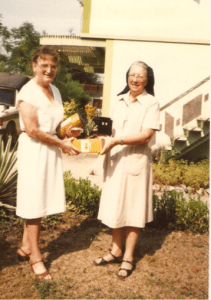 Hospice Waikato was the recipient of contributions in 1983, 1988, 1990 and 1992 to 1991 and 1983, and 1992 saw Club contributions to Foundation for the Blind. 1990 was a busy year for the club with funds being donated to Hospice, a Safe Cycling in (intermediate) schools programme (10 donated plus one to the Apple Driving School) and the provision of a mobility vehicle for the Cambridge RSA. Funds were raised for the Life Education Trust in 1991. A Garden Tour was held which raised funds to purchase a puppy named “Kansas” for guide dog training. A 21st birthday for the Club was held in November with upwards of 40 attending. The year ended with an Interior Decorating Seminar with the profits being donated to Hospice. The new District 16 comprising only Clubs in New Zealand held their first district Conference in 1991. The conference was attended by Area Director 1, Alison Wilson, from the Hamilton-Waikato Club. 1992 saw the first sponsorship of a Fashion and Design Award for High School students, with admission fees charged for the public. The proceeds from the first year were donated to the Cambridge, Matamata and Hamilton branches of the Life Education Trust. Local sewing machine retailers donated a sewing machine for the winner of the award each year. 1993 the proceeds were divided between Lifeline, UNIFEM and the Amelia Earhart award and in 1994 to Riding for the Disabled. In 1995 the Waikato Air Ambulance was the recipient. The profit in 1997 enabled a donation to the Haematology Unit at the hospital for a projector screen. 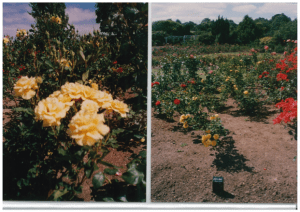 In 1993 the Club planted a Zonta Rose in the Rose Gardens at the Hamilton Gardens. A Charity Luncheon was held in September resulting in donations to Toughlove and the Special Olympics. Members also participated in the Special Olympics by looking after competitor’s gear and supporting them in their competition. The Club first supported the Young Women in Public Affairs Award in 1993 and four applications were received. The charity luncheon in 1994 resulted in donations to the Cancer hostel and Club fundraising assisted Air Ambulance. The Club also assisted in a telephone appeal for the Foundation for the Blind. A rose was planted in the hospice grounds to mark World Environment Day. In 1995 the Club started sponsoring a Pakistani girl, Neelo, Akhtar of Pennell High School and continued this sponsorship for many years until Neelo finished high school. In addition the club sponsored Johana Lainez from Honduras through World Vision until 2001. Special fundraising evenings within the club were held to providing the funding and were great social occasions. In 1997 a fun walk around Hamilton Lake was organised, which proved popular with funds from that and a mystery weekend raffle being donated to Hospice Waikato. The proceeds from the 1998 fun run enable donations to Parentline, Barnardos and Womens Refuge and in 1999 to the Child Cancer Foundation. The 2000 fun run resulted in donations to Westpac Air Ambulance and Child Cancer. The fun run was discontinued as the club felt the logistics and compliance outweighed the financial benefits. At the Club’s donation night in 1998, donations were made to Air Ambulance, Burns Support Trust and Wee Care. In 1999 donations were made to Hospice Waikato, Parentline, Women’s Refuge and Precious Babies (plus the Child Cancer Foundation). 2000 saw donations to Waikato Hospice, Breast Cancer, Air Ambulance, Child Cancer, Precious Babies, Women’s Loan Fund and Zonta International. The Club has a history of providing education scholarships, back to the 1970’s when scholarships were given to a Waikato Technical Institute student. The club ceased making these scholarships available in 1988. In 1990 the Club was approached by Maeroa Intermediate to provide a leadership scholarship for girls as Rotary already provided one for boys. The Club continues to award a cheque to the winner, together with a shield and the other 5 finalists are each awarded with a book (pictured). A new fundraiser initially promoted by the Zonta Club of Hamilton-Waikato II was the Dinner for Eight raffle whereby a chef cooked a meal in the winner’s home for eight people, including the provision of wine. 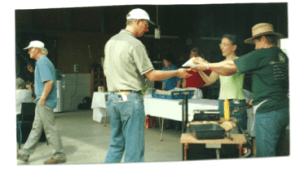 In the first year of the combined clubs the proceeds went to Hospice. In 1999 the Club instigated its Education Scholarship award and in later years the funds from this raffle were used for a second-chance tertiary education scholarship for a woman aged 25 years older. In 2008 this scholarship was renamed the Dame Silvia Cartwright Scholarship after the Club’s charter president and Dame Silvia herself presented the winner with the certificate at the Club’s 40th birthday celebrations in 2010. Following the District project supporting Teen Parent Units, the Club has continued to support the Teen Parent at Fraser High School (He Puawa Trust ) raising funds for Spotlight vouchers to purchase sewing supplies, one of our members donating a second-hand sewing machine, providing funds for the purchase of a car seat and towards the purchase of a van for use by the unit. 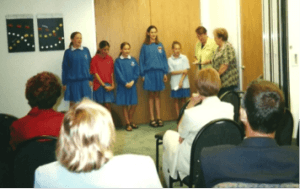 At its donations evening in 2002, funds were donated to Look Good…Feel Better and Dress for Success. Donations were also made to Zonta International for the Young Women in Public Affairs and Amelia Earhart. In 2003 the Club held a concert initiated by one of their musician members. An enjoyable murder/mystery night was held in 2004. 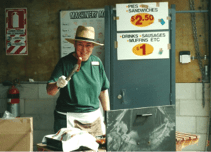 For two years in 200 7 and 2008 the Club sold stock sticks at Ruakura Field Days with half the funds sold in 2007 going to the Westpac Air Ambulance and in 2008 half the funds donated to Hospice Waikato to assist with the purchase of car. 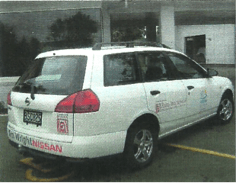 The Zonta logo was printed on the car. In 2007 and 2008 the Club held a Garden Evening at Palmers Garden Centre. The first year was reasonably successful, but the second year a lot of work was put in for a small profit, so since then the Club has held a very successful raffle at Palmers Garden Centre at the end of November/ beginning of December and the funds from the raffle has been used to fund the second chance tertiary scholarship. In 2009 the Club undertook a city-wide delivery of a “Home Sweet Home” pamphlet with the assistance of a grant from Trust Waikato. This anti-domestic violence pamphlet emphasised violence is not OK and gave local phone number contacts for sufferers of domestic violence. After the lapse of hosting of International Women’s Day breakfasts, the Club has been regularly hosting these breakfasts since 2009. In November 2000 the club held a brunch to celebrate its 30th birthday and had over 60 attendees. Donations in 2010 were made to New Horizons for Women Trust, Look Good..Feel Better and Dress for Success. In 2001 the club introduced a ‘latte cup’ at dinner meetings and the proceeds went to the ZI project eliminating maternal and neonatal tetanus in Nepal. The Hamilton-Waikato Club has always put up its hands in disasters and contributed funds to the Taieri Plans disaster, flood relief in Paeroa,, 2004 Manawatu flood relief fund, Womens Refuge in Christchurch following the 2011 earthquake. As a service organization, we have supported other charities with their fundraising, e.g., collection for Foundation of the Blind, Hospice Waikato, and Cancer Society Christmas Trees of Remembrance, National Heart Foundation. Our Club members have served on the boards of Mahi Tahi Hostel and the Teen Parent Unit at Fraser High School. The Hamilton-Waikato Club has regularly supported Women’s Refuge ( the neo natal unit at Waikato Hospital, Cross Rose Centre and the Women’s Night Shelter) with the provision of toilet bags (pictured). In the last few years the Club has acknowledged unsung heroines by presenting them with a certificate and treating them to dinner at a club meeting.